Is it a bee or a wasp? From the moment of its discovery during Captain Cook's voyage in 1770, this spectacular bee has baffled many. Unravel the mysteries of this "Great Pretender"! Above: the native Wasp Mimic Bee with her bold orange stripes. This distinctive, 13 mm long, black insect with bold orange stripes looks like a wasp, but it is in fact a native bee. 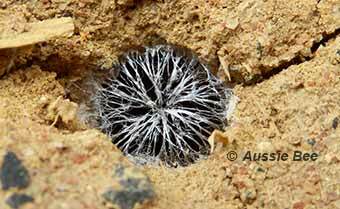 It mimics the colouring and shape of an mud-dauber wasp to frighten away predators. All bees have at least some fine feathery hairs on their bodies to help them collect pollen. Close examination with a microscope reveals that the Wasp Mimic Bee does have some fine feathery hair at the back of its thorax. So, despite its appearance, it is an Australian native bee. The Wasp Mimic Bee belongs to the family Colletidae and, like other bees in that family, females secrete a cellophane-like material which they use for nest building. The Wasp-Mimic Bee female nests in narrow crevices and she seals her nest entrance with a unique curtain of cellophane strands. Above: the intricate curtain that the Wasp Mimic Bee builds over the entrances of her nest. This curtain is made from springy cellophane strands. The bee can hide behind the curtain when she is at home, and she can push through the centre of the curtain to leave or enter her nest. 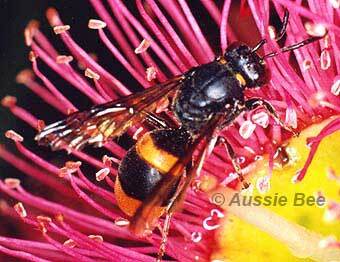 The Wasp Mimic Bee, Hyleoides concinna, is found in southern and eastern parts of Australia, including Tasmania. Similar species are found in Western Australia. Watch a video of a Wasp Mimic Bee working with her special cellophane nest entrance curtain.